Stable. Incompatible with acids, acid anhydrides, acid chlorides, chloroformates, strong oxidizing agents. Mesalazine is an anti-inflammatory agent, structurally related to the salicylates, which is active in inflammatory bowel disease. It is considered to be the active moiety of sulphasalazine. A study of the therapeutic properties of sulfasalazine and its constituents[mesalazine (5-amino salicylic acid, 5-ASA) and sulfapyridine] indicated that mesalazine is the therapeutically active component, while sulfapyridine acts as an inert carrier molecule to facilitate delivery to the colon. This discovery, coupled with the implication of sulfapyridine in most of the adverse events associated with sulfasalazine treatment, led to the development of Mesalazine as a pure therapeutic entity. developed to facilitate the delivery of mesalazine to more distal sites of inflammation. These include microgranules of mesalazine coated with a semipermeable ethylcellulose membrane (Pentasa®), mesalazine encased within a pH-dependent acrylic resin (pH-dependent delayed-release preparations: Salofalk®, Claversal®, Mesasal®, Asacol®), or conjugation of mesalazine via an azo bond to an inert carrier (balsalazide) or to another mesalazine molecule (olsalazine). In each case the properties of the delivery system dictate the site of mesalazine release. It is used for the treatment of active ulcerative proctitis. Numerous in vitro studies have investigated the effects of mesalazine on inflammatory processes in colonic epithelial cell lines or biopsy specimens from patients with active ulcerative colitis or with normal colons. Mesalazine also appears to reduce in vitro levels of LTC4, 5-hydroxyeicosatetraenoic acid (HETE), 11-, 12-, 15-HETE, PGD2 and platelet-activating factor. In addition to inhibiting interferon (IFN)-γ binding, mesalazine reduced IFNγ-induced cell permeability and expression of the HLA-DR product of the major histocompatibility complex in colonic epithelial cell lines. Recent evidence suggests that mesalazine reverses the antiproliferative effects of tumour necrosis factor-(TNF)α and inhibits TNFα signalling events in intestinal cells. Mesalazine may also reduce interleukin (IL)-1/1β and IL-2 production. A variety of data from experimental work, animal studies and preliminary clinical trials strongly suggest that mesalazine may have antineoplastic and potentially prophylactic (chemo-preventive) properties, which are comparable with those found with aspirin and other NSAIDs. Mesalazine shares similar molecular targets, interfering with inflammation, proliferation and ⁄ or apoptosis, as aspirin and other NSAIDs. This can be explained by the close molecular similarity of mesalazine and aspirin, in which the former differs only in structure by the presence of an amino group at position 5 of the benzene ring. Recent experimental and preliminary clinical work has demonstrated that mesalazine may have in vitro and in vivo inhibitory properties comparable to other NSAIDs. [12-14] Reversible inhibition of COX-1 and COX-2, NF-kB activation, MAP kinases and Bcl-2 by mesalazine, was found in experiments using different cell systems including lymphocytes, polymorphonuclear leucocytes (PMNLs) and cultures from normal and neoplastic cell lines of animal and human origin. In contrast to aspirin, which was shown to inhibit COX irreversibly, mesalazine (and other NSAIDs) inhibit COX and other steps (e.g. Bcl-2) reversibly. The molecular details for the majority of these reactions are only partly known, but recent work has shed light on some of these. Thus, inhibition of NF-kB activation is most likely to be mediated by inhibition of IkB degradation, the inhibitory unit of the NF-kB complex. It is worth noting that mesalazine has rather unspecific COX inhibitory properties with no preference for COX-2. After a single oral dose of prolonged-release mesalazine 250mg to volunteers, the median lag time (tlag) to the first detectable plasma concentration of mesalazine was 45 minutes (range 15 to 150). A maximum plasma concentration (Cmax) of 0.6 μmol/L (range 0.4 to 1.4) was recorded 240 minutes (tmax; 90 to 300) after dose administration. Corresponding values for acetyl mesalazine were: tlag 22 minutes (15 to 45), Cmax 2.9 μmol/L (1.6 to 3.4) and tmax 105 minutes (60 to 300). The plasma concentration-time profile following a single oral dose of prolonged-release mesalazine 1g to healthy volunteers was consistent with a continuous release of drug throughout the gastrointestinal tract. Plasma concentrations peaked at 0.53 mg/L 4 hours after administration, declined rapidly to 0.03 mg/L at 12 hours, then remained fairly constant over the next 24 hours before resuming the final decline, becoming undetectable 60 hours after administration. The area under the plasma concentrationtime curve (AUC) for mesalazine was 4.37-mg/L • h.
Mesalazine is primarily metabolized by acetylation in the gut wall and the liver, forming the therapeutically inert metabolite acetyl mesalazine. Both the parent compound and the metabolite are excreted in the urine. After a single oral administration of prolonged-release mesalazine 0.25g in 6 volunteers, the apparent mean elimination half-life of acetyl mesalazine was 802 minutes (range 608 to 993). Determination of the terminal half-life of mesalazine was not possible because of low plasma concentrations. After oral administration of prolonged-release mesalazine 1.5 to 4 g/day to volunteers, excretion of unchanged mesalazine accounted for 8 to 12% of the daily dose. Total urinary excretion of mesalazine plus acetyl mesalazine was 29 to 53%. [21,22,23] In volunteers, renal clearance of acetyl mesalazine was 12 L/h (201 ml/min) at steady state. In a 7-day study of 15 patients with ulcerative colitis, daily urinary excretion of mesalazine and acetyl mesalazine was higher with prolonged-release mesalazine (1.5 g/day) and pH-dependent delayed-release mesalazine (Asacol ®, 1.2 g/day) than with olsalazine (1 g/day). In an 8-week randomized trial of prolonged release mesalazine 1, 2 and 4 g/day or placebo in patients (n = 314) with ulcerative colitis, 16% of patients receiving active drug experienced treatment-related adverse events, compared with 22% of patients in the placebo group. No dose-response relationship was observed. In total, 5%, 9% and 7% of patients in the 1, 2 and 4 g/day dosage groups discontinued therapy because of treatment-related or unrelated events, compared with 12% of placebo treated patients. The most common treatment limiting adverse events were diarrhoea, abdominal pain, fever and melaena. In another 16-week study, the most common adverse events considered to be related to prolonged-release mesalazine treatment were nausea and/or vomiting (7.4 vs 3.7% in the placebo group), headache (5.2 vs 3.7%) and abdominal pain (4.3 vs 5.0%). In a 12-month study involving 205 patients with ulcerative colitis, adverse events necessitating withdrawal occurred in 14% and 33% (2% and 6% considered to be treatment-related) of patients receiving prolonged-release mesalazine 4 g/day and placebo, respectively. Treatment-related adverse events (most commonly nausea 2.9%, abdominal pain 1.9% and dyspepsia 1.9%) were experienced in 6.8% of patients receiving prolonged-release mesalazine. In contrast, 11.8% of patients in the placebo group experienced adverse events related to therapy. In a non-comparative study in 467 patients with Crohn’s disease who received prolongedrelease mesalazine at dosages up to 4 g/day for a median of 14 months, 12%of patients discontinued because of treatment-related adverse events, of which the most commonly reported were diarrhoea (4.3%), abdominal pain (3.6%) and dyspepsia (3.1%). Vainio H, Morgan G. Non-steroidal anti-inflammatory drugs and the chemoprevention of gastrointestinal cancers. Scand J Gastroenterol 1998; 33: 785–9. Bus PJ, Nagtegaal ID, Verspaget HW, et al. Mesalazine-induced apoptosis of colorectal cancer: on the verge of a new chemopreventive era? Aliment Pharmacol Ther 1999; 13: 1397–402. Reinacher-Schick A, Seidensticker F, Petrasch S, et al. Mesalazine changes apoptosis and proliferation in normal mucosa of patients with sporadic polyps of the large bowel. Endoscopy 2000; 32: 245–54. Egan LJ, Mays DC, Huntoon MP, et al. Inhibition of interleukin-1-stimulated NF-jB RelA ⁄ p65 phosphorylation by mesalazine is accompanied by decreased transcriptional activity. J Biol Chem 1999; 274: 26448–53. Fisalamine is an intestinal metabolite of sulfasalazine useful in the treatment of ulcerative colitis and to a lesser degree in the management of Crohn’s disease. Administered as a suppository, it appears to lack the hypersensitivity-type side effects of sulfasalazine. The active metabolite of Sulfasalazine (S699084). Anti-inflammatory (gastrointestinal). For the treatment of active ulcerative proctitis. 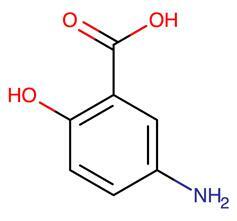 ChEBI: A monohydroxybenzoic acid that is salicylic acid which is substituted by an amino group at the 5-position. In manufacture of light-sensitive paper, azo and sulfur dyes. Odorless white to pinkish crystals or purplish-tan powder. Aqueous solutions acidic (pH approximately 4.1 at 0.8 mg/L water) . Sensitive to moisture. Water insoluble. 5-Aminosalicylic acid is incompatible with acids, acid chlorides, acid anhydrides, chloroformates and strong oxidizers. Flash point data for 5-Aminosalicylic acid are not available; however, 5-Aminosalicylic acid is probably combustible. 89-57-6 US $1.00 / KG 1KG High quality manufacturer TOP 3 largest production factory in China Chemwill Asia Co.,Ltd.